Our students are loved, and they know it. They are as much a part of the fabric of the community that makes up EagleNation as any faculty, staff or older student. This confidence helps them to shine. Each elementary class has an older partner class who stays with them through grade 5, and then they become the PK mentors. Learning to become a great mentor is just one way that we help studetns learn how to soar. 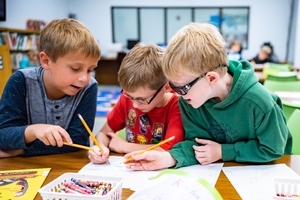 Elementary School is the foundation of the GC experience – the first step in equipping students with excellent academics, biblical knowlege and application, and leadership skills and experience. We are committed to building the strong and healthy foundation that fosters a love for life-long learning. Elementary is the age of developing strong social skills and ntegrating spiritual principles into everyday life. We are committed to establishing a stong foundation from day one and building upon it to prepare students to transition into MIddle School effectively. Both our curriculum and our classrooms are designed to be relational and multi-sensory to honor the way children learn best. Through learning centers, hands-on manipulatives, role-playing, technology, competitions, and solid curriculum and instructional strategies, our experienced teachers cultivate a nurturing and stimulating learning environment. With an average student:teacher ratio of 15:1, our classroom have gifted teachers who are better able to meet the needs of each child and help them explore the world of academics and the glory of His creation in every academic subject. These teachers lay a solid foundation for academic, leadership and spiritual development. Day after day, year after year, that small child who enters Greenville Christian School with a young and eager mind is loved, nurtured, challenged, encouraged and equipped to move on to Secondary, the threshold of adolescence, and becomes a student who is both confident and prepared.